I only read one of Jennifer E. Smith’s book before, The Geography of you and me, but yet I knew that I had encountered a master of the contemporary romance genre. After reading The Statistical Probability, I am now sure of it. If the young adult contemporary romance isn’t everyone’s cup of tea, rest assured. More than a romance, this book tells the tale of family struggles, dealing with change, and finding what kind of person you want to be. A divorce, a new wife, a missing flight, and a whole life changes. Here’s, in short, what awaits you in The Statistical Probability of Love at First Sight. When Hadley misses her flight from JFK to London Heathrow, she knows she might be getting late to her father’s wedding and her dreaded meeting with her new step-mother. But, in the waiting area and sitting next to her on the next plane, is Oliver. He’s British, obviously very beautiful, and time with him passes in the blink of an eye. And then, they lose each other in the chaos of the airport. Was this a one-flight meeting, or more than that? As predictable as this plot seems, at first, I have to say I was attracted by the setting of this story. An airport, travelling across the Atlantic, meeting a boy from another country, setting the story in the plane and then in London…What I found original in this story, was mostly this setting, and the way they meet each other. We’re not in the popular boy/ shy girl scheme, at all, meeting in the hallways… Jennifer E. Smith puts two characters in a very different context, out of their everyday lives, and manages, thanks to that, to create an interesting atmosphere to the story. Even more than that, we’re travelling with them across the world, and through their journey. What I loved about The Geography of You and Me, and found gladly in this book, too, was how realistic the characters were. Despite the fact that I can count the differences between Hadley’s life and mine, and believe me, there are lots, I could perfectly understand her way of thinking, her struggles, and why she acted the way she did. The main character was very endearing, I felt connected to her in a way, and that’s what made me hold on to the pages of this book, and hooked me in. Oliver’s character was, well, cute, I’d say, like every boy in a contemporary romance should be. He met all the standards of this kind of character, and, add the British accent, and there’s the jackpot. He has his moments, and acted strange, sometimes I would have liked to be in his mind a little bit. But we’re in a single point of view, we see the story from Hadley’s perspective, and, even if we weren’t in Oliver’s mind one single second, I genuinely could try to understand him, and liked him. What bothered some people in this book, is how it’s labeled as a romance first and foremost. Let me tell you, it’s not exactly what I would qualify as romance: despite being a romantic tension between the two characters, Hadley and Oliver, we’re always focused on Hadley’s life and its complications, especially towards her family. The purpose of her trip in the first place is to get to her father’s wedding in London, and to meet her step-mother. To see her family definitely destroyed. As you can guess, she’s not that happy about it. Anger, resignation, we follow her journey through acceptance of this new family in the whole story. This was the main focus of the book. Not the romance, not Oliver, but Hadley’s relationship with her father, the birth of a new family, and acceptance that people move on after a divorce. I found this choice risky, but really good to read about. The love story was more of a background to the family story. So, obviously, it could have used more plot twists, more deep feelings developed, the love story could have been so much more swoon worthy, as we all say. But this is a family story, with love helping in the way. If you’re looking for a great contemporary romance, but most of all a story about family, change, and acceptance, then do read this book. Endearing characters and a plot line just intriguing enough to spend a relaxing sunday afternoon. 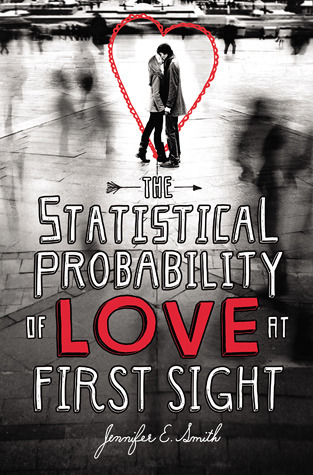 Did you read The Statistical Probability of Love at First Sight? What did you think about it? If not, are you planning to read it? Feel free to share your thoughts in comments! Jennifer E. Smith, The Statistical Probability of Love at First Sight, Published by Poppy/Little Brown, January 2nd 2012. Four minutes changes everything. Hadley Sullivan 17 misses her flight at JFK airport, is late to her father’s second wedding in London with never-met stepmother. Hadley meets the perfect boy. Oliver is British, sits in her row. A long night on the plane passes in a blink, but the two lose track in arrival chaos. Can fate bring them together again? More than 100 of you! Thank you! I think this was one of the first contemporary books I had ever read and this was years ago! I honestly loved this book so much when I read it. I thought the family aspect was great and the romance too. I really liked Oliver! Fantastic review, I have had this book sitting on my Kindle for the longest time waiting to be read, it will need to be pushed up the agenda.